Celebrating Digital Learning Day this year has been quite an experience, beginning last week and going all the way through this weekend, with the “official” celebration happening, of course, this Friday with a live feed from the Teaching and Learning Conference in Washington DC. Last week, I was honored by my friend and colleague, Dawn Reed, who nominated me as a Digital Learning Champion. She and I are working on our new book with Corwin, and “Research Writing Rewired” should be published later this year! She is a digital champion herself, and I have enjoyed collaborating with her again over the past year. Then, last Thursday, I joined Greg Mcverry for part of his open “Question the Web” course, discussing ideas for teaching with blogs and RSS. He recorded the conversation via Hangouts on Air, and we tried to keep it brief and focused coming in just over 20 minutes. You can watch the episode below and find more resources on pages linked above. District colleagues involved in the TTI have been working diligently to prepare a wide-variety of interactive sessions to provide a small lens into some of the learning and thinking going on in the realm of technology as a result of their participation in the Teacher Technology Institute. It was a great conversation — and brief, so very viewable — and I encourage you to view the recording. I look forward to seeing how all our colleagues in North Branch share their own inquiry and learning this Friday, and hope to blog about it soon. In DC this weekend for http://teachingandlearning2015.org/ Join us! So, that will be a great day, followed by a quick trip to Washington DC to join in the second day of the Teaching and Learning Conference. 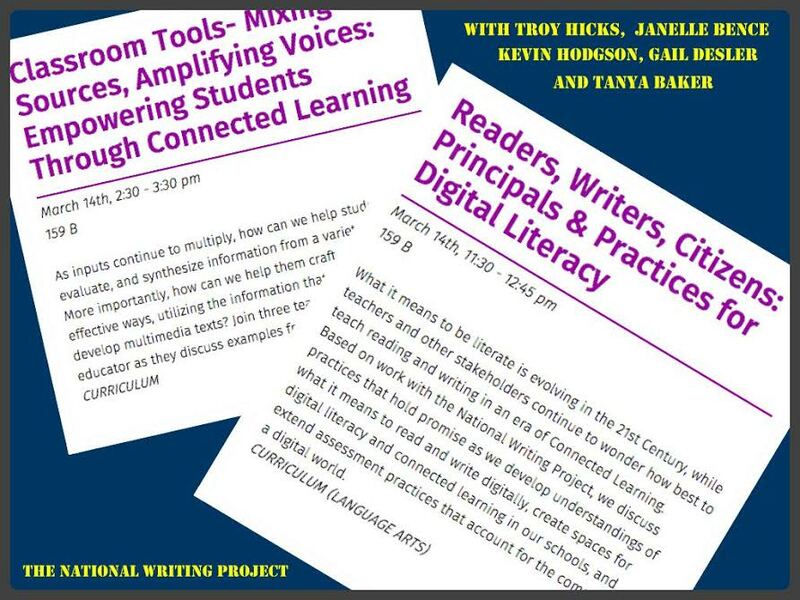 My brief trip to DC will include two presentations with my NWP colleagues Tanya Baker, Janelle Bence, Gail Desler, and Kevin Hodgson: “Mixing Sources, Amplifying Voices: Empowering Students Through Connected Learning” and “Readers, Writers, and Citizens: Principles and Practices for Digital Literacy.” I will post our handouts and materials on my wiki later this week. Often, while I’m delivering professional development workshops or webinars, teachers ask me about new tools that have been released since I wrote Crafting Digital Writing in 2013. While I try to keep links updated on the book’s companion wiki page, I know that many resources come and go each year. There are some stand-bys, such as Google Docs and Wikispaces, that have long track records and that many educators find quite useful. Sharing a link to these tools is often enough to point teachers in the right direction. Yet, when teachers want to dig deeper, to think about creative ways that they can invite students to play, transform, and critique existing materials with digital writing tools, sometimes the stand-bys aren’t enough. Yes, it is great that Google Docs allows us to embed images and links and that Wikispaces allows us to create a collaborative online classroom; but once our students are familiar with these tools, how can we help push their thinking and learning in new directions? Using NCTE’s policy research brief Reading Instruction for All Students as both guide and sounding board, experienced teacher-researchers Kristen Hawley Turner and Troy Hicks took their questions about adolescent reading practices to a dozen middle and high school classrooms. In this book, they report on their interviews and survey data from visits with hundreds of teens, which led to the development of their model of Connected Reading: “Digital tools, used mindfully, enable connections. Digital reading is connected reading.” They argue that we must teach adolescents how to read digital texts effectively, not simply expect that teens can read them because they know how to use digital tools. Turner and Hicks offer practical tips by highlighting classroom practices that engage students in reading and thinking with both print and digital texts, thus encouraging reading instruction that reaches all students. This afternoon, I recorded a podcast with Kristen and our editor, Cathy Fleischer, and I will share that link when I have it. Thanks to everyone who has shared the link via FB, Twitter, and G+. We appreciate the initial positive reaction and hope that the book lives up to your expectations! For some preview of the material, you can visit our companion wiki page. Finally, this month of digital learning continues next week with the MACUL conference next week and the Educator Collaborative’s Maker Space Camp, where I will deliver a virtual keynote on Monday March 30 (which is available for free viewing). So, this will be a busy Digital Learning Day (Week? Month?). I am pleased to be celebrating digital learning in so many ways, yet still I caution us all think about this day in the same way we would ask our students to think about ideas that they encounter online — critically and carefully. My 2013 post about Digital Learning Day is still as relevant today as it was two years ago, especially as the new assessments are upon us, and upon our students, too. Thanks to all my colleagues who are making my experience with digital learning so rich and fulfilling. I appreciate the work that all of you are doing and look forward to celebrating it this month and well into the future.